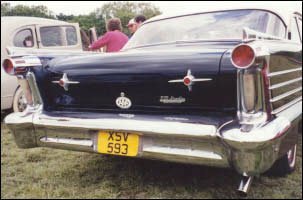 General Motors and Ford both celebrated their golden anniversaries in 1958 whilst Oldsmobile had been in continuous production for 60 years. Back in 1926 they were the first auto manufacturer to use chrome trim and over the years the company had earned a reputation for innovative styling. This was epitomized in the Starfire "Dream Car" introduced at the 1953 Motorama, and in line with the industry's obsession with aircraft design, it was named after a Lockheed jet fighter. It featured a fiberglass body, a 200hp rocket engine and wraparound front windshield. Despite this impressive heritage, the '58 Oldsmobile's are generally regarded as some of the ugliest cars ever made by GM. The '58 models followed the trend of the day. They were huge, looked like barges and had all the aerodynamics of a brick. The "all new" design featured massive fins with gaudy taillights, twin headlights for the first time, and chrome -lots of it. However, Oldsmobile were not alone in creating badly designed cars. Buick had their own version and Ford really bombed with the Edsel which turned out to be the industry's Titanic. Ironically, Ford not only managed to get it horribly wrong in 1958, they also got it completely right with the four passenger Thunderbird which sold twice as many cars as the previous years two seater. 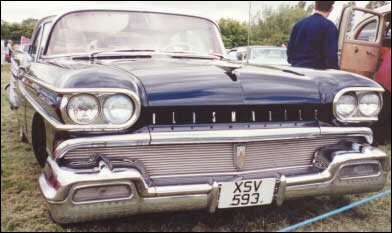 However, what Oldsmobile lacked in styling, was more than made up for in gadgetry. Air-suspension, or New-Matic Ride as Olds named it, was an option, as was a transportable transistor radio which could be removed from the car and carried as a portable radio. There was the headlight dimming Autronic-Eye and the "Safety Sentinal" speedometer which would flash and buzz if pre-set speeds were exceeded! The 16 model range comprised base Dynamic 88, mid range Super 88 and longer wheelbase 98 series. All were powered by the 371ci Rocket engine which produced 265 to 312 bhp depending on the carburetor set up. Total industry sales for 1958 were disappointing at around 4.25m which was almost half the sales achieved just three years earlier. Despite its mediocre styling, and a price tag of around $3,200, Oldsmobile managed to find new homes for 310k models which was enough to secure 4th place in the industry league table for the year. Motor Trend magazine road tested a Series 98 as reported in the December 1957 issue. The correspondent reported performance of 0-60 in 9.4 seconds using triple 4 barrel carburettors. He didn't mention what the fuel consumption was, but I suppose in 1958 that simply didn't matter! The black and white "88" pictured here was spotted at the '99 Fins 'n' Chrome show held at Stockton on Tees in the North East, which is where the car seems to have spent most of its UK life. It was advertised for sale as early as October '91 in Classic American, and it could have been yours for less than £3,500! I know it's changed hands a couple of times since and I think it was recently shipped to Ireland so not much chance of seeing it on the circuit this year.